For the past five years I’ve been working on a project. The project has taken many different forms, different shapes, and lots of different words. That project is a marriage book. The goal was to create something that would help Charles (co-author) and me in our own marriages. It needed to be simple, it needed to be biblically based, and it needed to be honest. It was born out of a passion about the fact that there are so many marriages struggling. When Charles and I served together in the Army, we did our very best to help couples, but what we did in person wasn’t enough. It felt like we could do more: we needed to put something out there that could be a floatation device for those couples who were in the midst of drowning. Writing this book has been a huge challenge. What made it even harder is that we didn’t want to write a book based on our own marriages. Our marriages are good, but we mess up a lot, so we wanted something that everyone could shoot for. The goal was to try to put something out there that every couple (no matter how long they’ve been married) could strive to achieve. Our own definition of love was flawed. It had all of our own baggage attached to it, and we both knew that there was more to love than what we could pull from our own lives. Our lives have been great, but we mess up a ton. We aren’t always good husbands, and we certainly have more to learn. So, with that in mind, we went to the source of love: God. We created a tool that took the characteristics of God’s love and made them practical enough to put into your marriage. As we poured our hearts out onto the paper, we found ourselves telling stories from our lives, from our experiences, and from what we found in God’s word. 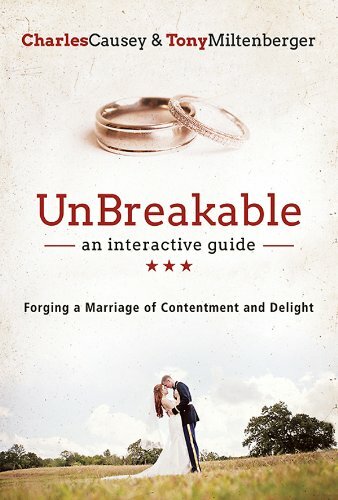 In the time of preparing this book, we realized one thing: while there is no such thing as a perfect marriage, there is such a thing as an unbreakable marriage. So, starting today, you can pre-order your copy of Unbreakable. The book is written like a workbook and has questions for groups as well as for individual journal. It is as honest and authentic as we know how to be. Our prayer is that you will find as much joy in using Unbreakable as we had in writing it. We hope that it will be a foundational tool for you to use as you strive for and integrate God’s perfect love into your own imperfect lives. If you feel called to help, please share this blog. And when you pre-order your copy, please share it on all your social media sites. Also, tell your pastor that you want an Unbreakable small group this fall!